Suddenly, within not that many years, Israel was thronged with blue-eyed dogs. The streets of Tel Aviv are free of doggie droppings because it's against the law not to pick it up, but pooches are popular and an extraordinary proportion seem to sport blue eyes. How exactly did this happen? Let's start where at least some of the blue eyes originated: imported huskies. Scientists working for a doggie-DNA sequencing company (i.e., not a university) discovered why huskies, specifically, have blue eyes: a duplicated sequence on chromosome 18. Science already knew about two other genetic variants associated with blue eyes in some dogs, such as Dalmatians, Border Collies, and Shetland Sheepdogs, but they didn’t apply to Siberian Huskies. The discovery by the U.S.-based company Embark Veterinary was based on DNA tests on 6,070 dogs and people’s own testimony and photographs of what their loved ones look like. The study was published in the prestigious journal PLOS Genetics. Why would anybody have their dog sequenced? Partly for the same reasons we test our own genomes: hoping to find out where we came from, and whether we harbor the potential for genetic illness. "By genotyping their dogs with Embark, our customers can learn more about the ancestry of their dog: what breeds are in its ancestry if it is a mixed breed," Dr. Aaron Sams, senior scientist at Embark, told Haaretz. "They can find out if their dog is at risk for over 160 health conditions, learn about genetic factors that influence various traits like coat and eye color, as well as body size and other traits," he elaborates. They also get to share photos and videos of cute dogs, he adds, and answer questionnaires to contribute to research studies, like this one. Since the domestication of dogs began (perhaps in prehistoric Israel! ), the species has become intensely affected – some would say sorely afflicted – by aggressive selection. This selection, whether for utility or looks, has led to what the authors politely call “dramatic phenotypic diversity” – look at a Great Dane next to a teacup Chihuahua, and you get the point. In small breeding pools, dangerous mutations can reach a high frequency. It may be useful to know what inherited weaknesses your furry friend might be harboring. That’s as far as the consumer is concerned. Scientists have other interests too. Genetic research has shown, for instance, that dogs and people have a similar genetic propensity to certain cancers, including types of leukemia and Burkitt’s lymphoma. That isn’t actually helpful to know yet, but scientists explain that since people and pooches share a pathogenetic basis for cancer, perhaps studying canine tumors will bring us insight into how tumors develop. 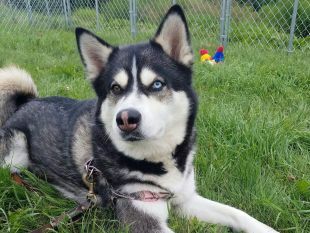 As for the eye color, huskies (and also non-Merle Australian Shepherds) turn out to have a long stretch of duplicated DNA on chromosome 18, in between two genes, CD82 and ALX4, Sams explains. No, we don't know what this stretch of DNA does exactly: "The region is just upstream of ALX4, so it is possible that it includes regulatory sequence that regulates this or other genes upstream from ALX4," he says. The ALX4 gene is relatively conserved in mammals, meaning that its genetic sequence barely differs from one species to another, such as rat, monkey, cow and your neighbor. Its conservation is indicative that the gene does something highly important, because the implication is that mutants in this gene fail to thrive or die. ALX4 is involved in the embryonic development of multiple systems, including our eyes. Mutation can cause profound problems, including abnormalities in the development of the eyes and facial features. Like all sexual beings, each dog has two copies of DNA – one from mother and one from father. 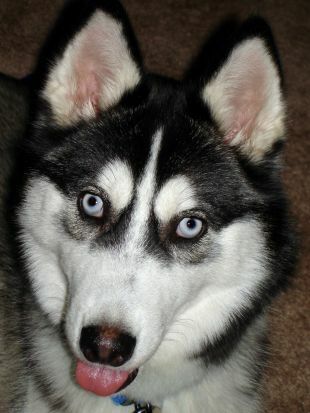 Just one copy of the variant sequence, either from mother or father, is usually enough to cause blue eyes, or heterochromia (blue and brown eyes) in huskies, the scientists say. However, like in humans, the genetics of canine eye color is complicated. It isn’t that brown eyes are “dominant” and blue eyes “recessive,” period. 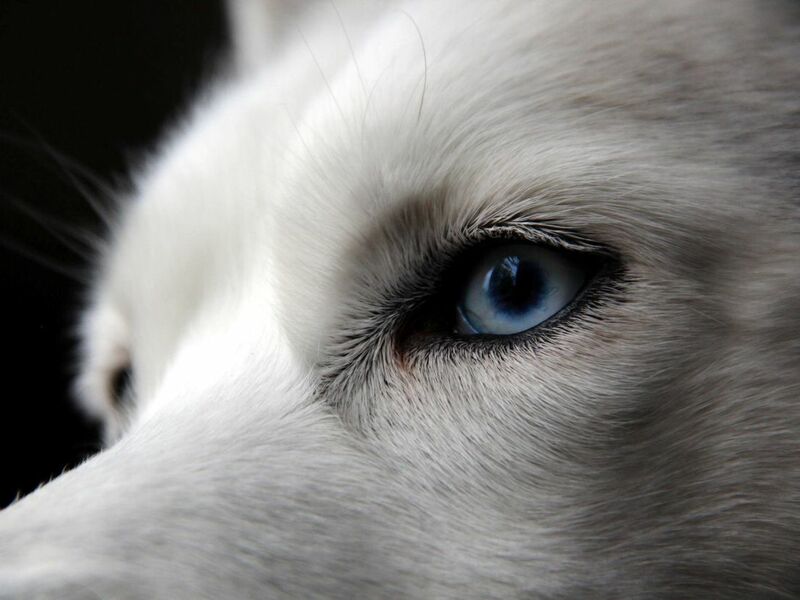 In dogs, some dogs with the genetic variant did not sport blue eyes. Evidently, other factors, including possibly epigenetic elements, are involved. The study was done by Adam Boyko, chief science officer at Embark, and Aaron Sams working for the U.S. company Embark Veterinary, which is a research partner of Cornell University’s College of Veterinary Medicine, who say theirs is a pioneering consumer genomics study on animals. Consumer genomics, they explain, links between vast genomic databases with phenotype information voluntarily provided via web-based surveys. Blue eyes in the Middle East are still considered exotic, although they are neither new nor even that rare. They have inspired many a wild notion, such as local aqua-eyed people being the distant descendants of Crusader invaders from Europe. Maybe some are. Some could be descendants of a fair-skinned people who migrated to Israel around 6,500 years ago from Iran or southern Turkey and peacefully mixed with the locals, as archaeologists deduced from the sudden appearance of a whole new, and unique, culture and pottery assembly after their arrival, and blue eyes. Some surely descend from other migrations. There are numerous sources of blue-eyed potential in the Levant. Not so in the dog’s case. The indigenous canines of the Middle East, the Canaan dog (the Egyptian “pharaoh dog” apparently originated in Malta), had brown eyes. Blue eyes are short of melanin, the dark skin pigment. Brown and black eyes are rich in melanin. Melanin protects us humans from ultraviolet rays (though we need the UV in sunshine to make vitamin D). The theory is that human blue eyes evolved with pale skin in northern climes with little sunlight to increase UV absorption so our distant ancestors didn’t succumb to vitamin D deficiency. 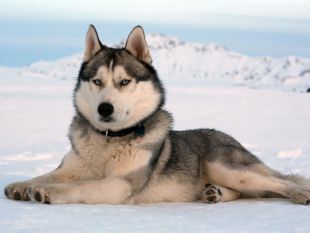 But whether the Siberian Husky’s iconic blue stare confers any evolutionary advantage remains unclear, the authors say. Is the canine chromosome 18 involved in melanin metabolism? Not clear: "The ALX4 gene has been shown to be involved in eye development in mammals, and close homologs of this gene in some species are involved in pigmentation of the eye," Sams tells Haaretz. "So we think that it is a valid hypothesis that this duplication affects eye pigmentation by altering the expression of ALX4, but that hypothesis needs to be further tested." Whatever the reason for the husky variation, it definitely didn't develop in the Middle East. One source of blue-eyed variants in Israel is probably the development in recent decades of immigrating with exotic family pets, from Persian cats to hairless dogs. Another is vogue. Huskies have become popular in Israel, though some might think anybody owning a large, pig-headed, heavily furred sled dog in the Middle East is barking mad. But then the odd St. Bernard can also be seen in the streets of Tel Aviv. We do not inquire why. But one attraction of the husky is definitely its exotic eyes. 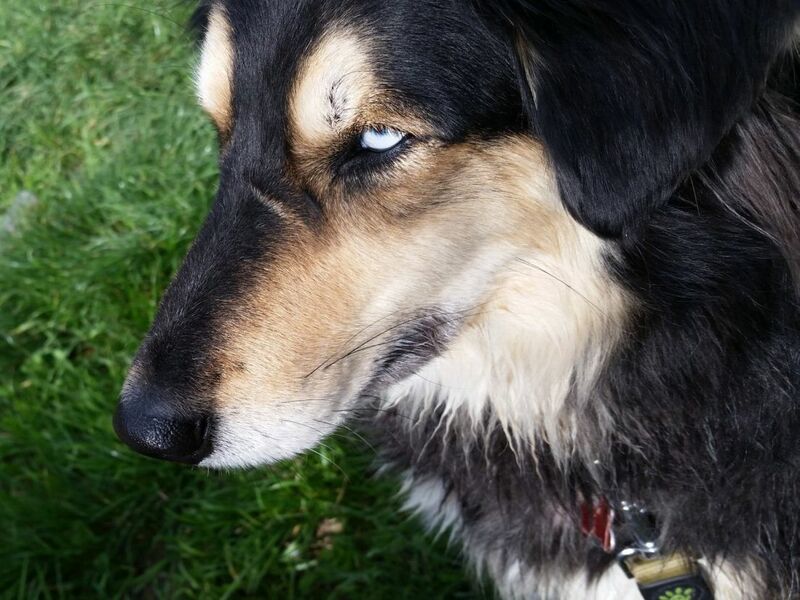 And that blue gaze began to spread in the local canine gene pool if only because many local dog owners are less than meticulous about their beloved’s mating habits and can’t be bothered, or refuse in principle, to breed it only with fellow variants. 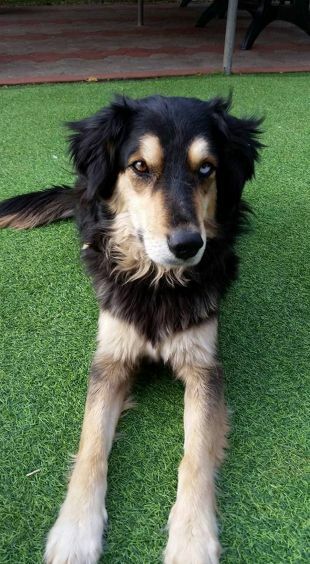 Julia Fridman, Tel Aviv-based owner of a blue-eyed half-breed husky and Shepherd ("a Shepsky"), shares why she adopted her pet: "Huskies always seem to be more human to me, like a mix of a person and a wolf in one. Their eyes are expressive of their feelings and so unique compared to all other dogs. They are wild and also kind all in one, to me anyway," she says. Their local mixing isn’t a bad thing for genetic diversity. 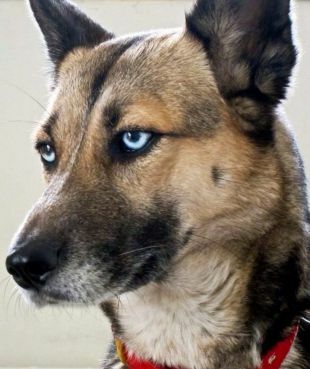 Meanwhile, one outcome is that Israel is thronged with blue-eyed and heterochromatic dogs that have some husky in them, but look more like German shepherds, pointers or just mutated mutts. "Huskies should never have been brought here," Fridman adds. "The climate is torture for them. I adopted mine (as opposed to buying one) and suggest that everyone else does that as well. Huskies don’t belong in the Middle East!" The fashion may not last. Sapphire-eyed Siamese cats were all the rage in Israel some decades ago and kittens could command a hefty price, but their star has somewhat waned. Familiarity breeds contempt.